Airline Loyalty Blockchain - Is it all hype? You take a flight to see family for Christmas, and you earn some frequent flyer miles…You buy a coffee from Starbucks once or twice…You fill up with fuel from a Shell station and sign up for their fuel rewards program…You purchase something at a store and the cashier gets you to sign up for their rewards program. And then… you realize that you have all these orphaned points and miles from loyalty programs which you don’t use regularly, and none of your reward accounts has enough points to redeem. In fairness – other than being persuaded to enrol – you haven’t changed your purchase behaviour to buy more from any of them – they were all purchases that you would have made even if they didn’t have a rewards program. But now you have a combined 200 points from all of them – and darn it! – they’re your points and now you’re wanting to buy a flight on a different airline for a family holiday and you want to redeem your points for a free flight… but you can’t… and that doesn’t seem fair, does it? Imagine a world where you can earn points for EVERYTHING you buy – from ANY store, hotel or airline… And then you can redeem your points for ANYTHING – free flights on other airlines, nights at a different hotel, a gift card for a different store or coffee shop… or even cold, hard cash!! This is the dream that many blockchain/cryptocurrency evangelists are pushing (usually associated with an attempt to raise obscene amounts of speculative investment via an ICO). The solution above (earning everywhere – and – redeeming anywhere) ALREADY EXISTS…. (shhh.. don’t let the investors find out). It’s called “cash back reward programs”, run by banks all over the world. For example – in the U.S – Chase, American Express, and Citibank – are revolutionizing and disrupting the multi-billion dollar frequent flyer industry by allowing members to earn on ANY airline, ANY hotel, and ANY retailer – and letting them pool all of their points and redeem them for what they want, when they want. One of the biggest “a-ha moments” amongst blockchain developers at the recent Loyalty Live conference in Chicago was when my industry colleague Jay Sorensen from IdeaWorksCompany, delivered a presentation which highlighted the sheer volume of revenue that Frequent Flyer Programs receive from selling miles. Loyalty Programs are all about building affinity for their brand, and their own currency. Delta Airlines, for example, wants you to fly Delta; they want you to want to earn Delta SkyMiles; and they want you to want to earn more Delta SkyMiles by signing up for their credit card (American Express purchases miles from Delta – on track to reach $4 Billion per year, according to Delta’s own investor disclosures); and crediting hotel stays and car rentals to Delta (all of whom also purchase miles from Delta). When you redeem your miles, Delta wants you to remember that the way to another redemption is by subsequently earning, EVEN MORE, Delta SkyMiles. The last thing that Delta wants – is for you to redeem your miles on American or United. And the last thing that Burger King wants – is for you to redeem your points for a free burger at McDonald’s. To understand the value of these loyalty programs to the economics of airlines – read this: – IS AMERICAN’S LOYALTY PROGRAM WORTH MORE THAN THE AIRLINE? And to understand why loyalty programs want members to redeem within (not outside) their own loyalty program ecosystem, and how points-expiry (breakage) affects program economics – read this: – LOYALTY MYTHS: IS BREAKAGE GOOD? I joined Phil and other experts in both the Blockchain and Loyalty industries in Chicago for the last two days at the Loyalty Live conference to discuss this very issue. 2/ Some super-smart developers that understand the future potential of the underlying blockchain technology to overcome some of the technical limitations that loyalty programs face today – and are focused on listening to loyalty program executives – to understand the business problems of major loyalty programs, and to jointly evaluate the cost-benefit ROI of choosing blockchain based solutions over existing legacy technology. They’re also trying to better understand the economics and drivers behind what makes loyalty programs successful, and why they do, and don’t, make certain decisions. If you’re talking about “how cryptocurrencies and blockchain will disrupt and revolutionize the loyalty industry”, or you’re not getting replies when you email or call loyalty executives – you’re in box 1. On the other hand – if no-one has heard of you, and you’re quietly working away, under-the-radar, with an advisory board and group of investors that include traditional, large loyalty program executives and former program managers – you’re more likely in box 2. The most common use cases put forward by blockchain proponents are listed above. Thinking back to the initial example in this article – proponents suggest that being able to fully exchange points between programs, in order to make it easier for consumers to use orphaned points – is the holy grail of loyalty programs that can be solved by blockchain and cryptocurrencies. Seth Miller and I tackled this very topic. As Seth explained – “Fungibility” (the ability to easily trade or exchange points into cash or another currency), might sound attractive to members with orphaned points – but is at odds with the business objectives of loyalty programs. As explained above – loyalty programs are designed to generate affinity for the brand and its currency – not for its competition. The last thing that a program wants – is for members to redeem their points for the competitors’ products. Programs invest in acquiring members and growing their emotional connection to the brand – in much the same way as a first date leads to further dates and a deepening of the relationship. The aim of a loyalty program is to generate brand loyalty and repeat business – both of these aims are potentially undermined if the members of your program are using your points to actually engage more deeply with another program, and not redeeming through your own channels. One of the most common myths about loyalty programs – is that the outstanding points liability is a problem – that needs a solution. Stop and read the linked article now… Don’t worry, we’ll wait. There are plenty of loyalty programs that don’t make it easy for members to redeem their points. Equally, there are plenty of loyalty programs that do make it easy and have a substantial catalogue of redemption options – everything from flights and upgrades, hotel and car rental redemptions, to gift cards, flowers, wine and the ability to redeem for fuel. A quick look at qantaspoints.com and you can see an almost unlimited selection of partners at which you can earn or redeem points with the Qantas Frequent Flyer program. All of which has been achieved without blockchain technology. The biggest challenge with adding earn and redemption partners – in the business decision process – not a technology problem. Programs want to be selective with who they partner with, and the kind of merchants that members can earn and redeem with. Programs are also notoriously tough negotiators when it comes to setting the price that merchants have to pay per point/mile, in order to offer the program’s currency to the merchant’s customers. In my view – blockchain, and more specifically – blockchain solutions in payment-tech/fin-tech, could open up new functionality and/or cost-efficiencies to partner transaction networks. This is a potentially promising area to watch, but blockchain companies will need to remember that loyalty programs are still not looking for a ‘free-for-all’ when it comes to partners. One of the key learnings that came out of this week’s Loyalty Live conference, is the importance for blockchain companies to separate discussion of cryptocurrencies (such as Bitcoin etc) from the discussion of the underlying blockchain tech. Some proponents argue that allowing loyalty program members to be able to exchange their points/miles for cryptocurrency – may be attractive to members – and therefore it’s imperative that loyalty programs move their programs to blockchain in order to enable this functionality. Not a bad argument – except that the ability to exchange your points/miles into cryptocurrency already exists today. In fact – Loylogic and Coinify formed a partnership in 2017 to allow loyalty members to do exactly that. And it doesn’t require the loyalty program itself to change its underlying technology platform. 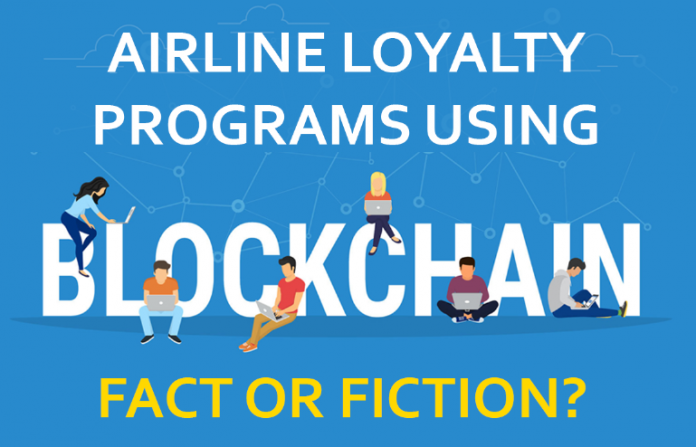 If we put the novelty and appeal of loyalty programs aside – airlines and travel represent a number of other potential opportunities where blockchain technology could solve business problems. Reservations and distribution systems are incredibly complex systems, often based on inefficient legacy platforms that include requirements for payment, settlement, and auditability. The challenge is that while blockchain proponents waste time focusing on loyalty solutions that don’t have a related business problem – the focus isn’t on areas that could deliver real business benefits. So what should blockchain companies and developers do? Focus on real business problems. Not what you assume (often incorrectly) are the problems, as we highlighted above. Talk to loyalty program executives and learn and listen to the pressing business problems for which they need solutions. Understand that ultimately – the choice in technology – whether legacy or blockchain, will likely be an IT decision. Call out the stupidity of some of the more ridiculous claims being made by blockchain advocates described in type 1 above. Otherwise – programs will assume you’re equally wasting their time. Look to partner with existing loyalty program vendors. You may think that they are your competitors – but they have existing relationships with program executives, and ultimately – these are the folks who are more likely to win any program contracts. No-one understands the business needs of loyalty programs more than these vendors. If you truly have a revolutionary development – they want it, and will be interested in what you have to say. Despite some of the more ridiculous claims being made, blockchain is a real technology, with real potential. While they don’t seek the press right now – there are already significant projects underway, working closely with loyalty programs, and in many cases led by former program executives. These are the projects that will bear fruit and be successful with bringing blockchain and loyalty programs together. And you won’t ever hear them talking about cryptocurrencies disrupting and revolutionizing the loyalty industry. Blockchain will continue to evolve – but at this time is not much more than a well-developed solution looking for a problem… any problem.